Soon after take-off - and just 450ft (137m) above the ground - the aircraft's nose began to pitch down. The Wall Street Journal - which says it has spoken to people close to the ongoing investigation - says the information it has "paints a picture of a catastrophic failure that quickly overwhelmed the flight crew". An investigation of the Lion Air flight suggested the anti-stall system malfunctioned, and forced the plane's nose down more than 20 times before it crashed into the sea. 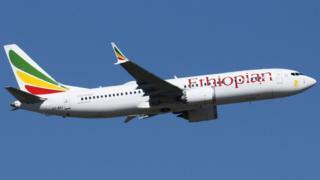 The Ethiopian authorities have already said there are "clear similarities" between the Lion Air incident and the Ethiopian Airlines crash. Boeing is also revising pilot training to provide "enhanced understanding of the 737 MAX" flight system and crew procedures.